Aerial photo of Raystown Dam from the US Army Corps of Engineers website. BALTIMORE – The U.S. Army Corps of Engineers has notified emergency management officials that the dam at Raystown Lake in Huntingdon, Pa., is prepared to perform during the storms connected to Hurricane Sandy. The dam and reservoir has been functioning as designed – to store significant volumes of water and thus reducing downstream flows and delaying possible flooding over the next few days. The project is monitored daily and there are no indications of any problems. The dam will continue to function as designed and is prepared to hold the maximum amount of water if needed. The U.S. Army Corps of Engineers began construction on the dam in 1962 and it was completed in 1988 at a cost of $77 million. The project has prevented $269,616 million of flood damages through fiscal year 2011. The dam protects all areas along the Juniata River downstream of Huntingdon. have a combined discharge capacity of 301,000 cubic feet per second. The project encompasses 29,700 total acres. On April 3, 1993 the lake reached its pool of record at elevation 802.89 NGVD which was 67% of its storage capacity. For current information on Baltimore District dams and reservoirs, go to their home page, www.nab.usace.army.mil. If you like ragtime music, here’s your opportunity to hear some that great music played by some of the top ragtime musicians in America. July 20th to 22th, 2012 are the dates and Rockhill Furnace, Pennsylvania is the place to be to hear great ragtime, just like it was played in grandpa’s time. You’ll be carried back to the good old days on the early 20th century trolleys at the Rockhill Trolley Museum. For you amateur and budding ragtime players there will be opportunities to showcase your talent during the festival. Check the Directions page for motel information in the area. Our festival is shaping up to be one of the premier East Coast venues for ragtime this year. Mr. Bryan Wright will be discussing “Ragtime past and present” during the festival. Watch for details at http://www.rockhillragtime.com/. Note: All concerts will be at the United Methodist Church in Orbisonia, 613 Cromwell Street, Orbisonia, PA.
Friday evening after the concert, the doors of the Iron Rail Bed and Breakfast will be open for a drop in reception. Come and meet and mingle with the performers and fellow fans. We hope to see some impromptu playing during the evening, but if not, your hosts, Dave and Cindy Brightbill, have lots of rolls for the player piano!! Snacks will be served and the evening will be a great opportunity to hear some ragtime stories as well as music. For late night ragtime fans ten o’clock at the Iron Rail is the place to be for more music, chat and good times. 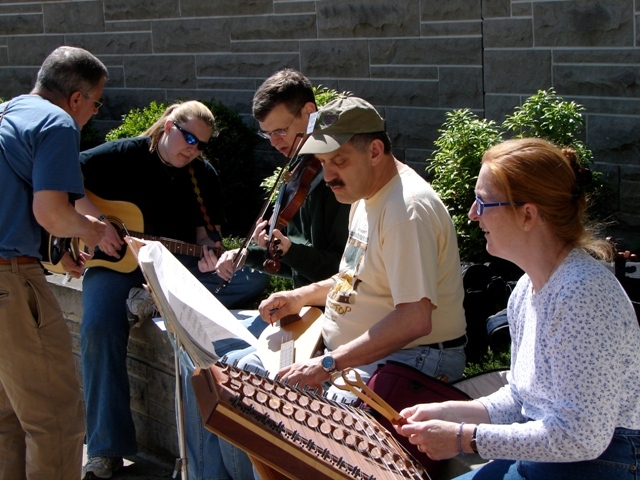 Have breakfast with the performers at the Iron Rail at 9am. David and Cindy Brightbill will host a buffet breakfast. for $6 per person. Contact David for reservations. Visit with the stars while having a great breakfast. Again this year the festival will hold free concerts at the Rockhill Trolley Museum on Meadow Street in Rockhill Furnace. Our featured artists will perform. Walk-up talent is encouraged, so here’s your opportunity to not only hear the pros in an informal setting but to showcase your talent. Times will be announced later. The pavilion next to the gift shop is where to go to enjoy the trolleys rolling by while listening to ragtime on the piano there. Back in the golden age of ragtime music, the trolley was the most popular methods of travelling around town. Experience what it was like to travel in those days by taking a ride on some of America’s Historic trolleys at the Rockhill Trolley Museum, just across Meadow Street from the station. Trolley time is any time from 11:00am to 4:00pm. Trolley tickets: Adult: $7.00, Children: $4.00 (2 to 11), Under 2: FREE! Saturday afternoon at 2:30pm our performers will be in concert. Saturday evening at 7:00pm our performers will be in concert. Adam Swanson will provide music at the 9:30 am service at St Luke Lutheran Church in Mt Union. Mount Union is straight north on 522. Adam will provide prelude, offertory and postlude selections all with a gospel flavor. The main part of the service will be a local southern style gospel group known as “Forever Gospel” in 4 part harmony. David Brightbill is the Organist Attire is informal. Our free concerts will continue on Sunday at the piano at the Rockhill Trolley Museum. Our featured artists will again perform, subject to their time constraints. Walk-up talent is again encouraged, so here’s another opportunity to showcase your talent. Times will be announced later. The Trolley rides continue on Sunday on the Rockhill Trolley Museum. Trolley time is any time from 11:00am to 4:00pm. Trolley tickets: Adult: $7.00, Children: $4.00 (2 to 12), Under 2: FREE! Our Sunday afternoon concert will start at 4:00 pm. The Golden Voice of Ann Gibson, accompanied by Fredrick Hodges. Ann is going to feature music from the Great War era. She is sure to please! Sunday Afternoon Concert Tickets: $20.00 per person. All-Concert Pass is $70.00. This does not include entry into the after hours events. Deluxe Pass: $80 for All Piano and Vocal Concerts, and entry to the After hours Events. 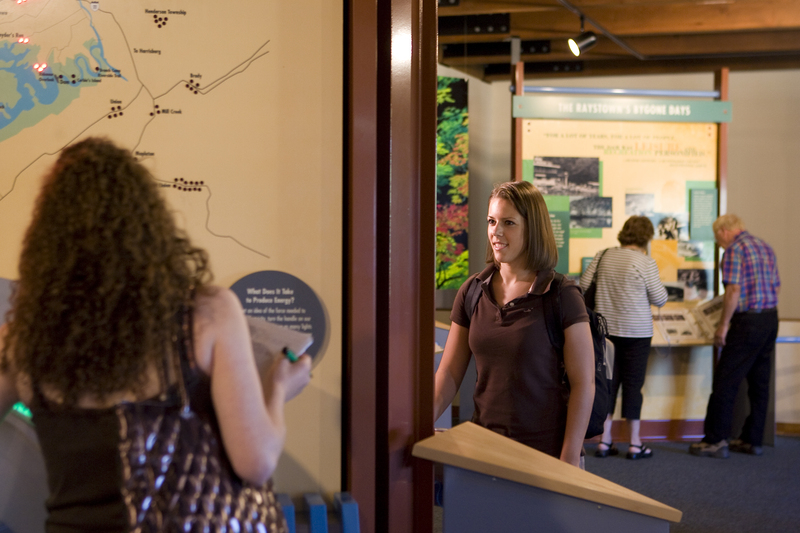 Every year, more than 20,000 people pass through the Raystown Lake Region Visitors Center inside Raystown Lake’s Seven Points Recreation Area near Hesston, Pennsylvania. The Visitors Center is home to the US Army Corps of Engineers Raystown Lake Project Ranger Staff as well as the Huntingdon County Visitors Bureau. The two organizations work closely together in the building’s operation and programming. This cooperation was evidenced this morning as Park Furniture of Huntingdon delivered some beautiful lodge furniture as a donation for a new seating area in the main lobby. Park Furniture is a member of HCVB, and has been very generous in providing the furniture, which they intend to rotate as styles change. 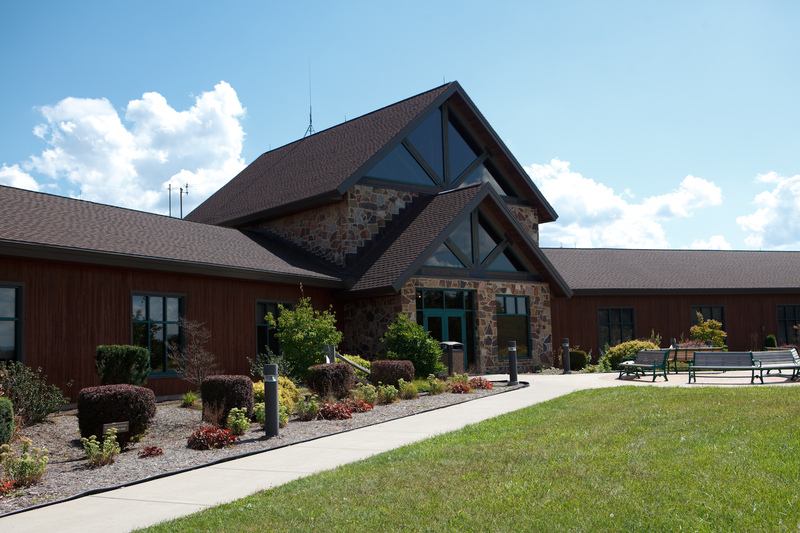 In addition to having a great and comfortable place to relax in air conditioning on a hot afternoon, the Visitors Center features exhibits, displays, and public restrooms, as well as one of the best overlooks of Raystown Lake, all free of charge. 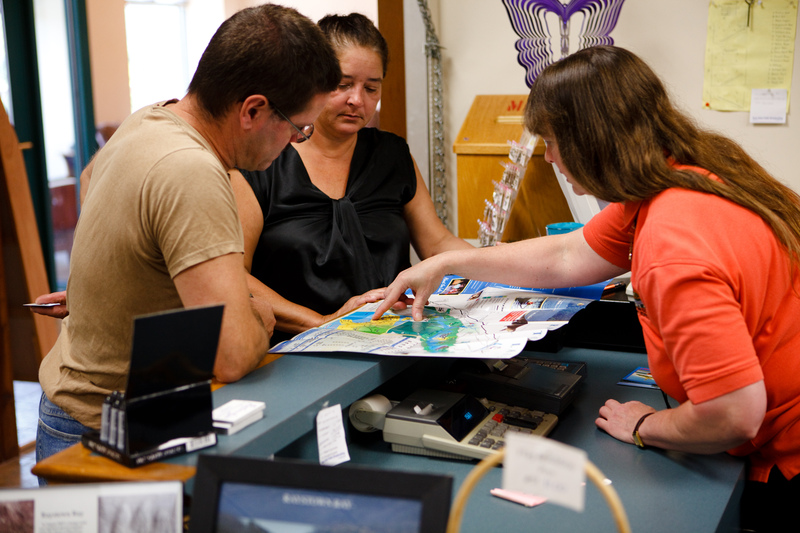 The staff of the Huntingdon County Visitors Bureau is always willing to answer questions, give directions and recommendations for things to do, places to eat, places to stay, places to shop, and more at the information counter. The Visitors Bureau also operates the Raystown Reflections Gift Shoppe, where you can grab a quick snack, Raystown Lake souvenirs, local artwork and crafts, books about local history, other works by local authors, and more. The Visitors Center is also a trail head for the Hillside Nature Trail and as of May 2012 for the Allegrippis Trails, and soon to be for a loop trail connecting all of the campsites within the Seven Points Campground to the Visitors Center, picnic areas, Seven Points Beach, and Seven Points Marina. From now through August 14th, every Tuesday morning HCVB hosts a Wake-Up Reception that includes displays and door prizes from area attractions, restaurants, and shops, continental breakfast, and a featured guest. Tuesdays Mid-June through Mid-August 9:30-10:30 AM. The HCVB Visitor Wake-Up Receptions continue each Tuesday morning from 9:30-10:30 a.m. through August 14, 2012, at the Raystown Lake Region Visitors Center in the Seven Points Recreation Area. The Wake-Up Reception series is a great place to learn all about the fun things to do and great places to visit in the Raystown Lake Region. The series continues with special events planned each week on Tuesdays through August 14. Each visitor reception typically includes 14-22 displays and door prizes from area attractions, eateries, and shops; free snacks while supplies last, a door prize drawing for a free pass for two to take Seven Points Marina’s Sightseeing Tour aboard the Princess Lake Cruiser on Tuesday afternoon. Welsch’s third collection of poems, The Death of Flying Things moves through three seasons in Pennsylvania’s breathtaking center. Within, read what it feels like to ride the oldest roller coaster in the world (located in Altoona), hear the roiling tensions at the bar near Malcolm Cowley’s birthplace (in Cambria County), consider the threat and fragility of flowers, hear what smoke means in November in Pennsylvania, and note the unlikely combination of black walnuts and baseball. This is the 7th annual Folk College weekend in Huntingdon! Come and experience some of the best folk music has to offer, ranging from traditional Irish to world renowned Mark O’Connor, Spanish percussion and contemporary interpretations of traditional music. Concerts are held on Friday and Saturday evenings, May 25 and 26 in Rosenberger Auditorium on the Juniata College Campus, starting at 7 pm. Tickets are available atthe door, $10 for HCAC members, $12 for all others. and a special appearance by Mark O’Connor. Check out details online at www.folkcollege.com. Come out to the Huntingdon County Home and Outdoor Show this weekend! One dilemma that happens with 80 degree days in April is: “Should I turn on the air conditioning, or not?” For those of us without central AC, turning on the air conditioning means cleaning windows and sills, cleaning and lugging a window unit out of the basement or attic, mounting it, and hoping the fact that you have never recharged it doesn’t come back to haunt you this summer. For all of those reasons plus the savings on the electric bill, most of us try to hold out as long as possible before turning on the AC. With that in mind, we offer this article by our friend Ken Hull, author of Going Local! An Adventurer’s Guide to Unique Eats, Cool Pubs & Cozy Cafes of Central Pennsylvania. After all, the last thing you want to do on a hot day without air conditioning is cook! This article first appeared in the 2009 edition of the Raystown Lake Region/Huntingdon County Visitors Guide. 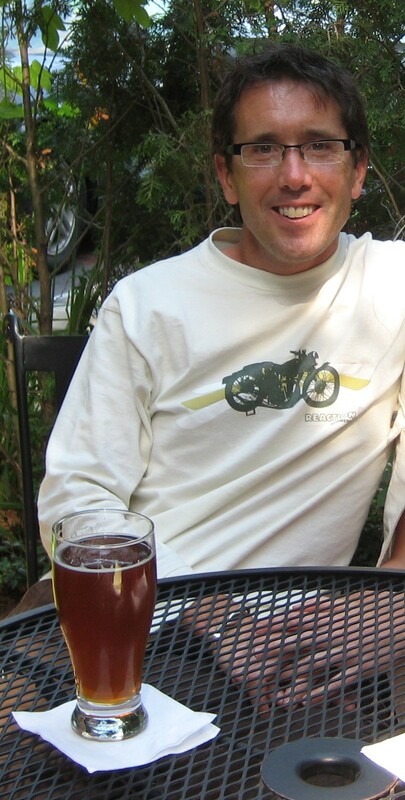 Ken has since published Going Local 2: A Second Helping. For some great options for eating out on a hot April day, visit Raystown.org/Places-To-Eat. Enjoy! I love Huntingdon County. Though a Centre County native through and through, I have close ties to this region to my south and visit often. My buddy’s folks have a cottage along the beautiful Juniata River and I’ve spent many a lazy day drifting quietly in a peaceful cove at Raystown Lake. Not only that, but I live in a structure that grew out of the rich mountain soil of Huntingdon County nearly a hundred years ago. What I mean is; I built a log cabin out of trees that came from a wood lot south of Cornpropst Mills. It’s a beautiful place to live and every time I travel down Rt. 26 I recall the adventure of finding these logs and the great experience of moving them to Boalsburg. Speaking of adventures and experiences, I’ve recently published a book about them in regards to unique eats, cool pubs and cozy cafés of central PA. 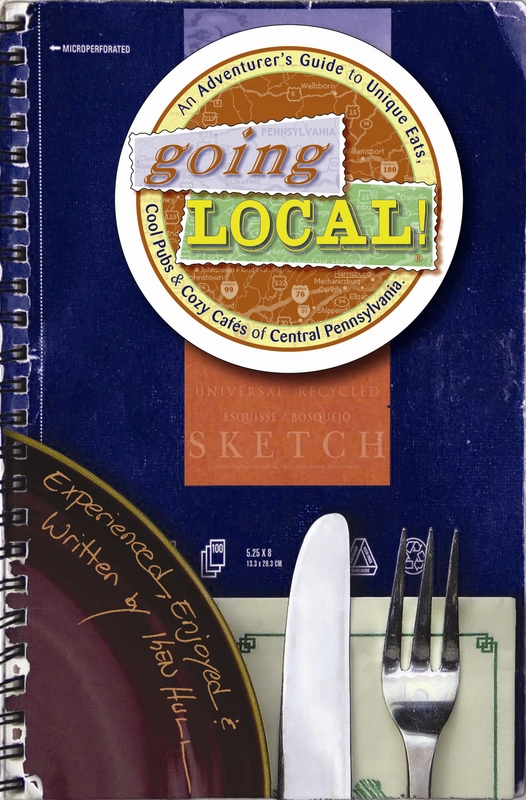 The book is called Going Local and it chronicles my journeys as I crisscross the state aboard my 1994 Harley Sportster in search of locally owned places to eat and drink. in a while I “let my hair down” and go for the stack. But only if the pie is warm, otherwise the ice cream doesn’t melt into the pie and create a whole new blend of flavors. However, I digress. Seriously though, Huntingdon Co. has it all, so let me just get to some of the things you’ll find here to fill your stomach, warm your heart and support independently owned businesses. Breakfast places are a good place to start and why not? Where else can you show up with bed head and be addressed as sweetie no matter your age or gender. Simple dishes like bacon and eggs can be found as well as more gourmet offerings like sweet potato pancakes. Coffee in the morning is most folk’s salvation and you’ll find that at all the breakfast spots. But for me a good latte or cappuccino in the afternoon is always an option and there are even cafés here that offer those. Lunch is one of those meals that gets the shaft a little I think. You’re either too busy or needing to get somewhere to stop. Well, most of the rest of the world considers lunch the main meal, so if you want to join with them Huntingdon Co. has plenty of places to stop, take some time and enjoy. With great soups, sandwiches and even pizza, your midday meal will not only be yummy but keep you going on your adventures. Now about dinner; my friends, it’s a tough call here. As I so boldly stated, I’m somewhat of a food snob and most definitely a beer snob. Not that I look down on things like onion rings (which, by the way, there’s a place in Huntingdon that has the world’s best – no lie) because in my book (literally) I consider a good burger as sacred as a good steak. There’s casual as well as fine dining, and let me tell you, you’ll be blown away by both. And, whether a hand-crafted beer or fine wine is your choice with dinner, or a perfectly made martini beforehand, you will find all and in atmospheres that are welcoming and easy-going. No taste bud or stomach is discriminated against here… only embraced. Huntingdon’s new cultural district partnership, 4 and More, will present its next Lunch & Learn event on Monday, March 12 at noon in the Natural Connection Wellness Center at the corner of 4th and Mifflin Streets in downtown Huntingdon. Ann Marie Wishard, expert herbalist and owner of Sweet Annie Herbs, will talk about the medicinal, cosmetic, and culinary uses of herbs. Wishard, who moved her business to Huntingdon from Centre County fifteen years ago, has been studying, growing, and using herbs for almost four decades. She has formulated over 50 herbal and nutritional combinations to address a variety of health issues. She has spoken at Penn State University and other colleges, hospitals, retirement communities, and trade shows. Wishard has appeared on such nationally-recognized television programs as The Montel Williams Show, The Sally Jesse Raphael Show, and CNBC’s Alive and Wellness. A published author, she wrote Herb Talk: The Book That Grows in 1996, and has since penned several revisions. To order lunch, call Oven One at 814-643-6899 by 11am on the day of the event, and it will be waiting for you at the Wellness Center. The cost is $7.50, and includes a beverage. Audience members are also welcome to bring their own lunch to the event. The Lunch & Learn program is free and open to the public. 4 and More is an initiative involving the Huntingdon County Historical Society, the Huntingdon County Library, the Huntingdon County Arts Council, and the Huntingdon Health & Wellness Association, as well as various business partners in historic Huntingdon with a goal to promote the 4th Street Cultural District as a destination for arts, entertainment, education, shopping, and dining. Visit facebook.com/4andMoreHuntingdon for more information. Lincoln Caverns & Whisper Rocks, near Huntingdon and Raystown Lake, is proud to announce the opening of its 82nd season. Beginning March 1, tours are offered throughout the spring, seven days a week, from 9:00 AM until 4:00 PM each day. Extended summer hours begin Memorial Day weekend with the last tour starting at 5:00 PM, and July 1 through Labor Day with the last tour at 6:00 PM. Visitors are treated to a one hour interpretive tour through two spectacular crystal caverns, Lincoln Caverns and Whisper Rocks. Always a pleasant 52°, tours can be enjoyed anytime, rain or shine. No reservations are necessary to experience this unique underground environment. During the leisurely walk through the two caverns guests of all ages enjoy exploring winding passageways and splendid rooms surrounded by the widest variety of speleothems, or cave formations, in Pennsylvania. Professional cavern interpreters share the fascinating story of the geology and discovery of the caverns. Lincoln Caverns specializes in educational programs for schools, Scouts, and other organized groups. Package tours for 2012 include Geo Packs for schools and youth groups, Ultimate Underground Birthdays, and complete badge programs for Scouts featuring a variety of activity choices, including “An Introduction To Speleology” pre-tour program, ‘Geoworks’ hands-on workshops, panning for real gems, and overnight programs in the learning center. Lincoln Caverns’ indoor learning center makes programming possible year round, regardless of the weather. Several popular special events are planned for the 2012 season; Discovery Days, June 23 & 24, celebrates 80 years of discovery and Dunlavy family history with special historic tours and workshops and crafts offered throughout the weekend. Lincoln Caverns’ 29th Annual Ghosts and Goblins tours are coming Fridays and Saturdays in October with a brand new tour and theme for 2012. The summer months feature Kids Cave Kamp, Photography Tours and Flashlight Adventures. 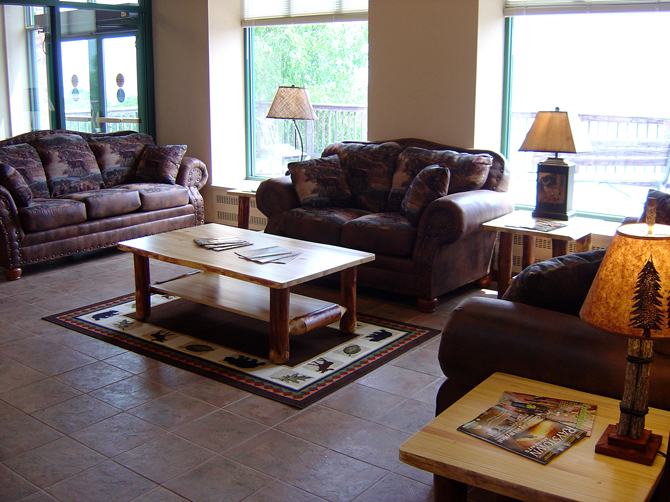 Whether traveling with a family or an organized group, Lincoln Caverns offers informal, personalized tours, plus various other amenities, making the visit a memorable one. Warrior Ridge Campground, picnic pavilions, nature trails, gem panning, and Raystown Country’s largest souvenir and gift shop are also located on the premises. Lincoln Caverns is located just three miles west of Huntingdon, PA, near Raystown Lake. Group leaders, teachers, and individuals interested in Lincoln Caverns’ tours and educational offerings are invited to call(814)643-0268, FAX (814)643-1358, visit our website at www.lincolncaverns.com or write: 7703 William Penn Hwy., Huntingdon, PA 16652, for more information. You came to Raystown Lake to get wet, splash around in the lake, feel the spray on your face as your boat glides across the glassy water. But wait, that spray is not coming from the boat’s wake, it is dropping from the sky! Yes, it does rain at Raystown Lake, just as it does everywhere there is a lake. But don’t despair. Seize the moment . . . and the shopping bag . . . and head to Huntingdon. Let’s start our shopping with Sweet Annie’s Herbs, Huntingdon’s original herb apothecary. Sweet Annie’s is a small shop with a large selection of herbal and other natural supplements, many formulated by Annie Wishard herself, as well as fresh spices, dried flowers, bohemian skirts and blouses, and, well, let’s just say it’s a shop you don’t want to miss. For a totally fun experience, check out Whisper Rocks Souvenirs and Gifts at Lincoln Caverns, the largest gift shop in the Raystown Lake Region A distinctive feature of Whisper Rocks is, well, its rocks. There is a vast array of very reasonably priced rocks, fossils, and gemstones for the rock enthusiast. And for the bat lover, Whisper Rocks has all the information you need. Next, drop by Dunkle’s Antique & Craft Mall where you will discover locally made products, primitives, home decor, Americana, jewelry, candles, potpourri, a huge selection of soy candles, lotions, bath soaps, body sprays, and many seasonal items. They sell the prettiest bird houses on the block, and the cutest whimsical metal cows and cats you’ve ever seen. Originally known as Grove’s Office Supplies, this is a store that knows how to add and subtract. The store has added a JC Penney Catalogue Center; a new line of American made handbags known as Cinda b to complement its large collection of Vera Bradley bags; and Kameleon jewelry, also made in the USA, to accompany the Chamilia charms and beads already in-house. Groves recently expanded its online presence with a new website that offers office supplies, scrapbooking needs, rubber stamping products, art supplies, and vintage antique and collectible items, in addition to tutorials for crafting. What did Groves Office Supplies subtract? The words “office supplies” is gone because the store has evolved into so much more. Laney’s Feed Mill is another place you don’t want to pass up. You can buy Outback Chair Company hammocks and chairs, Carhart clothing, and Beaumont pottery. Grab a bag of Laney’s store-made specialty bird seed blends to go into one of their beautiful Audubon bird feeders. In 1998 the store changed hands and there have been a few modifications but one thing hasn’t changed—it is still a great place to shop. Whether you are looking for cookbooks, cocktail napkins, or classy readers; Ginger Yaps or gift baskets; artsy clothing or aprons for the chef, you’ll be delighted at the variety in Reeves Gift Shop. And if shoes are your love, you’ll find everything from pictures of shoes to books about shoes to actual wearable shoes embellished with glitter and animal prints at this quaint little shop. If none of the above floats your boat (ok, I just couldn’t resist that one), how about taking a journey along the heART of The Alleghenies Artisan Trail. 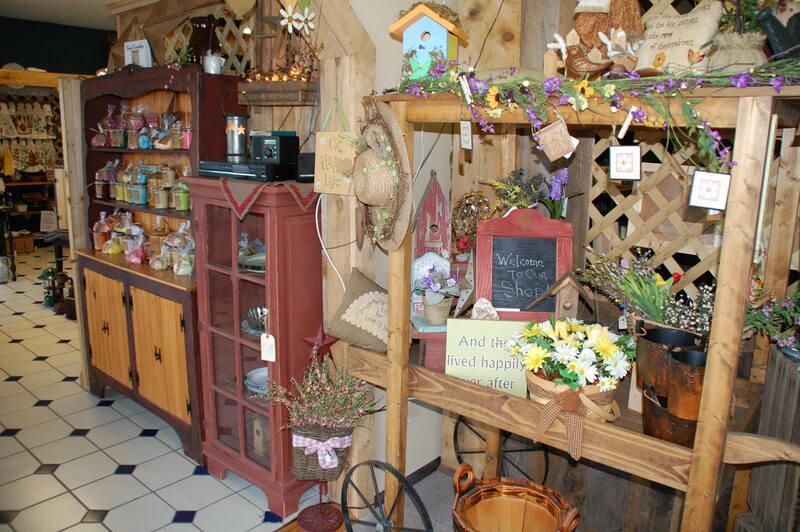 Discover the Log Cabin Gallery Shop, a modest log structure filled with a variety of arts and crafts. Also on the trail is Vintage Art Glass with its remarkable inventory of beads, custom stained glass, and blown glass. Of particular note is the custom-made jewelry created by owner Leah Davis Dell. This is the place to go for a one-of-a-kind piece of jewelry from a one-of-a-kind artist. Raystown Reflections Gift Shoppe located at the lake’s visitor center offers a mix of local crafts and gift items as well as the usual t-shirts and coffee mugs with Raystown Lake branding, providing the shopper with a taste of the area. Need to furnish your vacation home in the Raystown Lake Region? Check out Park Furniture and Appliances offering appliances (and appliance repair), audio and video equipment, furniture, bedding, flooring and home security systems. Park also is a Weber Grill dealer. And Sears Hometown Store offers all brands of appliances, big screen televisions, home and garden tools, and the best customer service you’ll find anywhere. For the outdoor enthusiast, visit Rothrock Outfitters and Saxton Outdoor Supply. Both are filled with everything you need for your outdoor adventure, rain or shine. Don’t forget to pick up your Allegrippis Trails map for some very excellent biking; as well as Purple Lizard Raystown Lake and Purple Lizard Rothrock State Forest maps. With this many shopping opportunities in Huntingdon, you might just start praying for more rain at the lake!